Looking for Good Hangman Words? I’m shocked, shocked to find gambling going on here! We at Hanging Hyena, as loyal guardians of the public morals, have launched a historic research project. Yup, we’ve already booked our tickets to Stockholm. Our question: Are certain words for hangman harder to guess than others? What words should you play in hangman if you suspect your opponent is cheating? In other words, we want very HARD hangman words…. To understand the impact of cheating on game outcome, we dissected how a hangman cheat program gives the cheating player an advantage. First, your effective vocabulary is massively expanded – with about 70K eligible words at your disposal, you’re the uber word-nerd! But wait, there’s more! The cheat tool eliminates most of your word recall bias – eg. since you probably don’t actually walk around thinking about midevil warfare or flesh eating warts! But the really big edge – which trumps all the others – is that a good hangman cheat program lets you use what statisticians call “conditional probability” to eliminate words faster. This lets you step around the worst of the good hangman words. For example, the distribution of letters does vary by word length. E is best for longer words, A is best for shorter words, S is usually a very good second guess. Static decision making tactics like this lose their value several moves into the game. If several guesses have already been made, the universe of possible words may be reduced to under a hundred – with a radically different letter distribution. A cheat program gives a player the ability to refine their next guess using the remaining words after each guess. This will create a significant advantage (-2 handicap for Spock, – 8 handicap for Homer Simpson). During the past several days, we have played about 240,000 games of hangman, using a simulator. For the computer scientists in the audience, we ran this as a map-reduce job. We took the solver program behind this site and applied it to every word in the Enable dictionary (same one used by Zynga for Hanging With Friends). The computer used the suggest letters feature of our solver to pick the most effective letter to guess for each round. We kept track of how many strikes each word racked up and tallied the answers. And we created rules to find good hangman words. Since every player has the choice of guessing a letter or guessing a word, our simulator looked at how many potential words remained at the end of each guess. Once the list of possible words got small enough, it would switch to guessing words (vs. iterating through the remaining letters). This mimics how a human guesser usually acts (filters down to a list of possible words, picks a target word to focus their final guesses around). As most of you are well aware, Hanging With Friends (the usual field of battle for this stuff) gives you a handful of strikes until your cute little character takes a tumble. 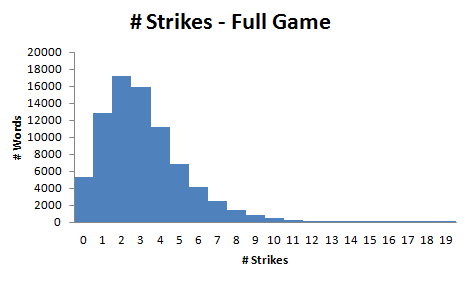 Fortunately for you, our solver gets the word in under five strikes almost 80% of the time. Yippie!!! There are a bunch of “skunk words” – words where there is a good chance a rational opponent can guess the word without a single strike. Some of these were actually relatively intelligent sounding words – they were just part of a fairly small set of words you could find at with safe guesses (A, E, etc.). Easy prey for a highly literate player. Many words are hard to solve – even with a hangman solver. These are likely to work against a normal player. This was the starting point for finding unbeatable words. Surprisingly- most of these hard words are not weird words. No 15th century art. No pagan rites. No suspicion? Weird words are not good hangman words. So what do you send your frenemy? What are the Unbeatable Words? In a word…4 or 5 letter words. No. Not THAT four letter word. Although it is also hard to guess. The safest words inflict strikes before they get most of the word on the board. JAZZ is an interesting case. While it is technically hard to guess, we’re not sure if you can actually get the double Z in Hanging With Friends (rare tile). It is also fairly famous as a hard hangman word, so an experienced player will likely be on the lookout for JAZZ. 4 letter words ending in “uff”. Nine to choose from, most you know (cuff, buff, puff, etc.). Plus you will inflict a bunch of strikes before they figure out you played an “f”. We approached this project as an analysis of traditional Hangman. However, for those of you interested in Hanging with Friends, you should be aware that Zynga tweaked their version which reduce the number of guesses. The most significant tweak is their policy of giving you a free letter – usually the last vowel of a word. This reduces the average # of guesses required (for a hanging with friends cheat) by 20% (about 1/2 guess per word). So there you have it. Some of these words are not like the others. So get off your duff (another excellent choice) and go prank a cheetah with one of the impossible words! Interesting – I also noticed that some of the words I’ve played in Hanging With Friends seem particularly hard to solve – particularly ones with double vowels (double E comes to mind). How did those do in your computer program?